Diarrhoea caused by Escherichia coli is an important cause of infant morbidity and mortality in developing countries. Enteropathogenic Escherichia coli (EPEC) is considered one of the major causes of diarrhoea in children living in developing countries. The ability of diarrhoeagenic strains of E. coli to adhere to and colonize the intestine is the first step towards developing the disease. EPEC strains adhere to enterocytes and HeLa cells in a characteristic pattern known as localized adherence. Many epidemiological studies of diarrhoea have shown that breast-feeding protects infants from intestinal infections. Both immunoglobulin and non-immunoglobulin elements of human milk are thought to contribute to the protection from diarrhoeal agents. The effects of human milk and its protein components on the localized adherence of EPEC were investigated. Non-immunoglobulin components of human milk responsible for the inhibition of EPEC adhesion to HeLa cells were isolated by chromatographic fractionation of human whey proteins. Besides secretory immunoglobulin A, which has been previously reported to affect the adhesion of EPEC, free secretory component (fSC) and lactoferrin (Lf) were isolated. Even in concentrations lower than those usually found in whole milk, fSC and Lf were able to inhibit the adhesion of EPEC. α-lactalbumin was also isolated, but showed no activity on EPEC adhesion. This study demonstrated that the immunoglobulin fraction, the free secretory component and lactoferrin of human milk inhibit EPEC adhesion to HeLa cells. These results indicate that fSC and Lf may be important non-specific defence factors against EPEC infections. Enteropathogenic Escherichia coli (EPEC) strains comprise one of the various categories of diarrhoeagenic E. coli and are the leading aetiological agent of infant acute diarrhoea in Brazil [1, 2]. Infection by EPEC involves initial adherence of the bacteria to the intestinal epithelial cells via bundle-forming pilus (BFP), and subsequent intimate contact mediated by an outer membrane protein, intimin. This process leads to the effacement of enterocyte microvilli, forming what is known as the attaching and effacing lesion [3, 4]. EPEC strains adhere to HeLa and Hep 2 tissue culture cell lines, forming a kind of microcolony in a pattern termed localized adherence; they also form similar attaching and effacing lesion on cells in vitro . Many epidemiological studies of diarrhoea have shown that breast-feeding protects infants from intestinal and respiratory infections [6–8]. Both immunoglobulin and non-immunoglobulin elements of human milk are thought to contribute to protection against diarrhoeal agents [9–14]. It has been demonstrated that human colostrum, milk and oligosaccharides inhibited the localized adherence of EPEC strains to cultured cells [9, 15]. Furthermore, it has been shown that human colostrum contains IgA that recognise BFP and intimin, the adherence-associated proteins of EPEC [16, 17]. These findings indicate that interactions between milk elements and bacteria do occur, preventing the attachment of bacteria to epithelial cells [9, 15–17]. In previous work, we have shown that the non-immunoglobulin fraction of human milk inhibits the adherence of three other categories of diarrhoeagenic E. coli: enterotoxigenic E. coli (ETEC), diffuse adhering E. coli (DAEC), and enteroaggregative E. coli (EAEC) [18, 19]. Furthermore, two glycoproteins: lactoferrin (Lf), an abundant iron-binding compound, and free secretory component (fSC), an 80-kDa compound found in external fluids, were shown to be involved in the inhibition of adherence of ETEC . Preliminary studies carried out in our laboratory indicated that the non-immmunoglobulin fraction of human milk was able to inhibit the adhesion of EPEC strains to HeLa cells. Therefore, to investigate the inhibitory activity of human milk components, especially fSC and Lf, we fractionated milk proteins using a method developed to purify fSC, which also allowed isolation of Lf. All fractions obtained during the process were analysed to determine protein content and concentration, and ability to inhibit EPEC adhesion. The protein concentrations of defatted milk, casein fraction and concentrated whey proteins were respectively 12.0 mg/ml, 2.75 mg/ml and 9.24 mg/ml. These samples were diluted approximately 10 times for use in the inhibition assay, as cytotoxic effects on HeLa cells were induced at higher concentrations or with prolonged incubation of the milk protein fractions. Even at these diluted concentrations, defatted milk and whey were able to significantly inhibit the adhesion of EPEC by 20% and 17% respectively. No changes in adhesion pattern were observed in the presence of milk and in most cases the inhibitory effect was easily recognised by mere observation. SDS-PAGE protein separation of defatted milk (data not shown) and concentrated whey proteins (Fig. 1, lane 2) showed an identical and typical profile of proteins described for human milk . The bands of ~56.3 and 26.5 kDa represented heavy and light chains of immunoglobulins. The band of ~78 kDa represented lactoferrin and secretory component, as their molecular weights are very similar. Serum albumin and α-lactalbumin were represented by the bands of ~63.2 and 13.0 kDa; while caseins varied from 28.3 to 31.7 kDa . Coomassie blue-stained SDS-PAGE of the milk fractions. Lane 1, molecular mass markers (66, 45, 36, 29, 24, 20.1, and 14.2 kDa); lane 2, concentrated whey; lane 3, pooled fractions from the first peak of the Sephacryl S-200 (P1-S) column; lane 4, pooled fractions from the second peak of the Sephacryl S-200 (P2-S) column; lane 5, pooled fractions from the third peak of the Sephacryl S-200 (P3-S) column; lane 6, active pooled proteins separated by DEAE cellulose (fSC and Lf); lane 7, pooled protein not retained by Heparin-Sepharose (fSC); lane 8, pooled fractions eluted from Heparin-Sepharose with approximately 0.7 M NaCl (Lf). Electrophoretic analyses of the whey protein revealed that the whey preparation, even after acid precipitation, contained residual casein. Thus, in order to better understand the ability of whey protein to inhibit EPEC adhesion, purified casein and κ casein commercially acquired (Sigma-Aldrich Corp.) were assayed at 300 μg/ml. Neither of the caseins inhibited EPEC adhesion. Every protein peak eluted from the chromatographic procedure was assayed to determine its inhibitory activity on EPEC adhesion. The chromatographic profile of human whey proteins eluted from the Sephacryl S200 column is shown in Fig 2. At 320 μg/ml of protein, the immunoglobulin fraction (P1-S) eluted from the gel filtration inhibited adhesion of EPEC by 12%. SDS-page analyses of the immunoglobulin fraction presented a typical profile of sIgA, showing three main protein bands corresponding to the SC, heavy chain, and light chain, with estimated molecular weights of 78 kDa, 57 kDa, and 26 kDa respectively (Fig. 1, lane 3). It also contained bands ranging from ~28 to ~30 kDa that may correspond to casein which has remained after the precipitation. As purified casein did not inhibit bacterial adherence, it was assumed that sIgA was responsible for the observed inhibitory effect. Chromatography of concentrated whey proteins on Sephacryl S-200 HR column (2.6 cm × 80.0 cm). Peaks were monitored at 280 nm and eluted with 0.1 M Tris-HCl, pH 7.6, supplemented with 0.5 M NaCl, 1 mM phenylmethanesulphonyl fluoride, 0.1% NaN3 and 50 mM ε-amino n-caproic acid, pH 7.6; the flow rate was 120 ml/h and fractions of 5 ml were collected. The horizontal lines under the respective peaks indicate pooled fractions. P1-S, P2-S and P3-3 denote the pooled peaks. 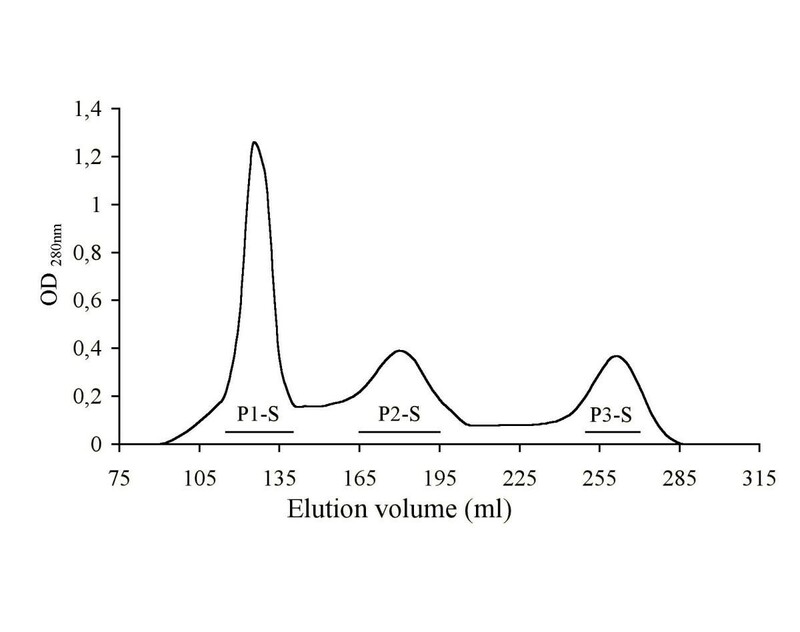 Inhibitory activity of 8% was found in the non-immunoglobulin P2-S fraction at 225 μg/ml, where Lf and fSC were present (Fig. 1, lane 4). Concentrated P2-S was applied to DEAE cellulose and the active fraction, containing both Lf and fSC, was recovered. This fraction showed one main protein band of approximately 79 kDa (Fig. 1, lane 6), which at 100 μg/ml, significantly inhibited EPEC adhesion to HeLa cells by 14%. Because the most prevalent contaminant in the purification of fSC is lactoferrin,  which has a molecular weight of about 80 kDa, the active material recovered from the ion exchange chromatography was applied to Heparin-Sepharose to separate fSC from Lf. Under this procedure, fSC and Lf were separated into two peaks. Thus isolated fSC and Lf significantly inhibited the adhesion of EPEC to HeLa cells at 105 μg/ml and 157 μg/ml, respectively. fSC showed a very strong inhibition (32%) while Lf exhibited a weak (4.5%), but still significant inhibition. As it has been shown that Lf may affect bacterial growth , growth of the E. coli strain was measured during exposure to the peak containing Lf under the same conditions as used in the inhibition assay. The CFU were determined and compared with the CFU obtained in the absence of Lf. No inhibition of bacterial growth was observed. Similarly, no growth inhibition was detected when same procedure was carried out using purified fSC. Electrophoretic analyses of the first peak eluted from the affinity chromatography showed the presence of a major protein band of 79 kDa, corresponding to fSC (Fig. 1, lane 7), and also the two bands of ~28 kDa and 31 kDa that may correspond to casein. Similarly, the second peak presented a band of 79 kDa corresponding to lactoferrin (Fig. 1, lane 8). To confirm the identity of Lf and fSC, immunoblotting assays were performed. Using anti-Lf, the main band of ~79 kDa corresponding to Lf (Fig. 3a, lane 2) and commercial lactoferrin (Fig. 3a, lane 3) were revealed. No Lf was present in the peak that contained fSC (Fig. 3a, lane 1). In the blot from the peak containing fSC, anti-fSC recognised the band of ~79 kDa (Fig. 3b). These results showed that both purified fSC and Lf were able to inhibit the adhesion of EPEC. 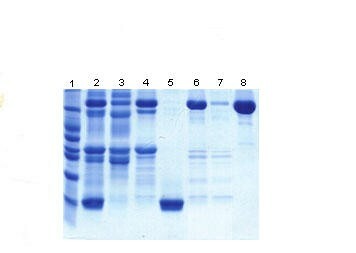 SDS-PAGE and immunoblotting of purified whey proteins. A: lanes 1, 2 and 3 correspond, respectively, to the pooled protein not retained by Heparin-Sepharose (fSC), the pooled fractions eluted from Heparin-Sepharose with approximately 0.7 M NaCl (Lf) and commercial lactoferrin stained with coomassie blue; lanes 4, 5 and 6 correspond to the same samples revealed by their reaction with Lf antibodies. B: pooled fractions not retained by Heparin-Sepharose (fSC) stained with coomasie blue (lane 1) and immunostained by reaction with SC antibodies (lane 2).C: P3-S stained with coomasie blue (lane 1) and immunostained by reaction with a lactoalbumin antibodies (lane 2). During the chromatographic procedure, α lactoalbumin was also purified (Fig. 1, lane 5) and identified using a corresponding antibody (Fig. 3c), but when assayed at 300 μg/ml, α lactoalbumin was not able to inhibit adhesion. Commercially available lactoferrin and α lactoalbumin(Sigma-Aldrich Corp.) from human milk at 300 μg/ml in 0.05 M Tris-HCl pH 7.6 containing 0.05 M NaCl, were also assayed to confirm their effect on the adhesion of EPEC. Commercial lactoferrin inhibited adhesion by 24%, while the commercial α lactoalbumin showed no activity. These results support our findings that purified preparations of Lf have inhibitory activity and that α lactoalbumin does not. This study demonstrated that the immunoglobulin fraction, the free secretory component and lactoferrin of human milk inhibit adhesion to HeLa cells by EPEC strains. Several studies have shown an important role of immmunoglobulins, mainly sIgA, in the protective effect of human milk against diarrhoea [9–11, 18, 19, 26]. The localized adhesion of EPEC to cultured epithelial cells has been shown to be inhibited by the immunoglobulins of human milk [9, 26]. As we verified that the immunoglobulin fraction inhibited EPEC adherence to HeLa cells, the present work supports previous findings. In recent studies, we have shown that the non-immunoglobulin fraction of human milk inhibits the adherence of ETEC, DAEC, and EAEC [18, 19]. Furthermore, two glycoproteins, lactoferrin and free secretory component, were shown to be involved in the inhibition of ETEC adherence . In the present work, we have shown that the same two glycoproteins, at lower concentration than found in human milk, inhibited the adhesion of EPEC. These results indicate that these compounds may present a broad range of inhibition, acting on different categories of diarrhoeagenic E. coli. Lf is considered to be an important non-specific defence factor against gastrointestinal infections, causing iron-deprivation of microorganisms by its iron-scavenging ability [12, 13, 27, 28]. More recently, specific Lf binding receptors have been described in several bacterial pathogens [29–32]. Studying the specific binding of Lf to E. coli isolated from human intestinal infection, Naidu et al. showed that some serotypes of EPEC and ETEC strains bound significantly more Lf than other pathogenic groups. As we found that Lf also inhibits EPEC adhesion, it may be possible that Lf binds to bacterial adhesion-associated compounds found in EPEC strains. Similarly, it has been shown [16, 17] that human colostrum contains IgA that recognises the adherence-associated proteins of EPEC. There is little information about the role of fSC in secretions, but some studies suggest that it may have a protective role against diarrhoea [34, 35]. In this work we showed that fSC inhibited the adherence of EPEC strains in vitro, indicating that this compound may be an important non-specific defence factor because it is also found in intestinal secretions  and may provide protection for the mucous membranes which are the initial target in most infections. Several studies have suggested a role of human milk glycoconjugates acting as cell surface homologues to inhibit pathogen binding to host cell receptors . Therefore, by inhibiting the adhesion of EPEC, the glycoproteins Lf and fSC may be functioning as receptor analogues. On the other hand, the work of Vanmaele et al. indicates that glycoconjugates containing fucosylated residues cause a decrease in the expression of the adherence-related proteins of EPEC, such as BFP and intimin. As Lf and fSC are rich in fucosylated oligosaccharides, they may be involved in such an activity. This study demonstrated that the immunoglobulin fraction, the free secretory component and lactoferrin of human milk inhibit EPEC adhesion to HeLa cells. Despite our lack of understanding of the specific mechanism by which Lf and fSC inhibit the adhesion of EPEC to epithelial cells, our results indicate the potential of these compounds to prevent EPEC-mediated infant diarrhoea or to act as therapeutic agents for treating EPEC infection. The EPEC strain, 0311-1 (O11 1ab:H2, eae+, bfp+ e EAF+) isolated from a child with diarrhoea in São Paulo, Brazil, was kindly provided by Dr. B.C. Guth (UNIFESP, Brazil). The bacterial strain was grown overnight in Trypticase Soy Broth at 37°C and 100 μl of this culture was inoculated in 5 ml of the same medium. Bacterial growth was monitored by spectrophotometry at 540 nm, and cultures were used in the assay when they reached 0.6 (exponential phase). Human milk samples were obtained from the Human Milk Bank of the Hospital Materno Infantil (Brasilia, Brazil). Aliquots of individual frozen samples were taken from at least 10 lactating mothers up to two months after delivery, and pooled. Fractionation was performed following the method described by Mestecky et al. to purify fSC, as previously modified . Briefly, defatted milk, casein and concentrated whey were obtained respectively by centrifugation, acetic acid precipitation and ammonium sulphate precipitation. Concentrated whey was fractionated on a Sephacryl S-200 HR column (2.6 cm × 80 cm) equilibrated with 0.1 M Tris-HCl, pH 7.6, supplemented with 0.5 M NaCl, 1 mM phenylmethanesulphonyl fluoride, 0.1% NaN3 and 50 mM ε-amino n-caproic acid. Fractions from peaks thus obtained were pooled, and proteins were precipitated with ammonium sulphate to 70% saturation. Concentrated proteins obtained from the second peak of the Sephacryl S200 HR column were dialyzed against 0.01 M Tris-HCl pH 7.6 containing 0.05 M NaCl, and applied to a DEAE cellulose column equilibrated with the same buffer. For further purification, the eluted material from the DEAE column was again concentrated by adding ammonium sulphate to 70% saturation, dialyzed against 0.05 M Tris-HCl pH 8.0 containing 0.2 M NaCl and applied to a Heparin Sepharose affinity column equilibrated with the same buffer. The protein content of the concentrated fractions was measured by the method of Bradford  and monitored by SDS-PAGE on acrylamide (10%) gels using the method of Laemmli. .
Adhesion tests were carried out as described previously  with some modifications. HeLa cells (1.6 × 105 cells ml-1, 600 μl) were grown for 48 h at 37°C in 199 medium with 10% foetal bovine serum in 24-well tissue culture plates containing a cover slip. The medium was replaced with 300 μl of 199 medium supplemented with 2% foetal bovine serum and 1% D-mannose to inhibit the eventual adhesion mediated by adhesins that bind to mannosidic receptors, 100 μl of a sample of milk, and 75 μl of an exponential phase bacterial culture. After 30 minutes at 37°C, wells were washed with phosphate-buffered saline six times, and 500 μl of 199 medium with 2% foetal bovine serum was added to each well. Plates were incubated for 3 hours at 37°C. Cells were then washed three times with phosphate-buffered saline, fixed with methanol and stained with May-Grünwald and Giemsa as described previously . Tests were carried out in triplicate on three different occasions, and 250 or more HeLa cells were observed in each preparation. The effect of defatted milk, whey proteins, and immunoglobulin and non-immunoglobulin fractions on bacterial adherence was determined by calculating the percentage of cells with microcolonies (formed by at least five attached bacteria) in relation to the control, carried out under identical conditions, but in the absence of a milk sample. 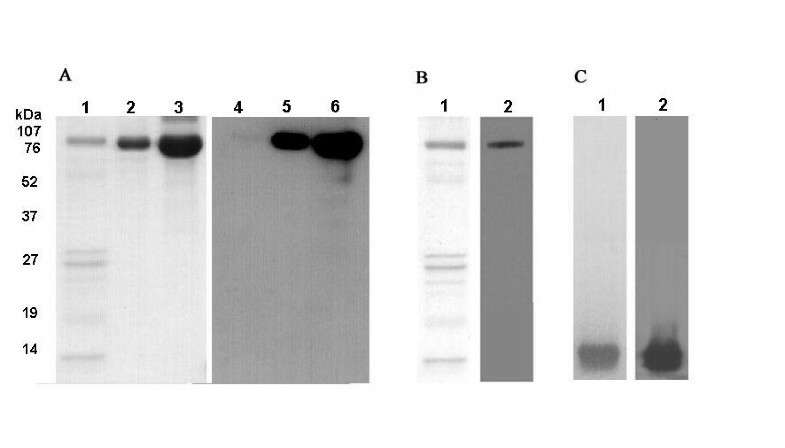 Western blot procedures including SDS-PAGE and electrotransfer to nitrocellulose membrane were carried out as described by Laemmli and Towbin et al. [22, 23]. Membranes were blocked with 0.2 % tween 20 in PBS for 18 hours at 10°C and then incubated overnight with commercially acquired antibodies (rabbit antibody to human lactoferrin, goat antibody to human SC, rabbit antibody to human ∝ lactoalbumin – Sigma-Aldrich Corp.). After three washes with PBS, membranes were immunostained using peroxidase-conjugated anti-rabbit IgG or peroxidase-conjugated anti-goat IgG (Sigma-Aldrich Corp.) and developed using the ECL detection system (Amersham Pharmacia Biotech). Differences in percentage of bacterial adhesion were compared statistically by the z test of proportions . This study was supported by FAP-DF, grant no. 193.375/95, and Nestle Brasil Ltda. We wish to thank Dr. E. Miazaki for assistance with statistics.